This recipe was used for Sean’s and Wanda’s wedding cake and most recently a birthday cake for Jim (a close family friend). Yum! 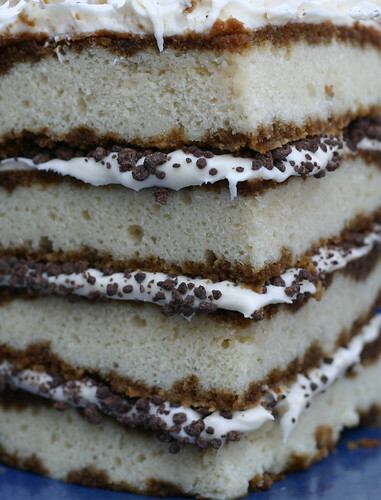 Look at those layers of Kahlua and coffee and chocolate and cream cheese Marsala frosting. I figured if Jim could remember a cake for 13 years and remind me every year therein the poor boy earned his own damn cake. I just halved the recipe and made four 8” round layers. 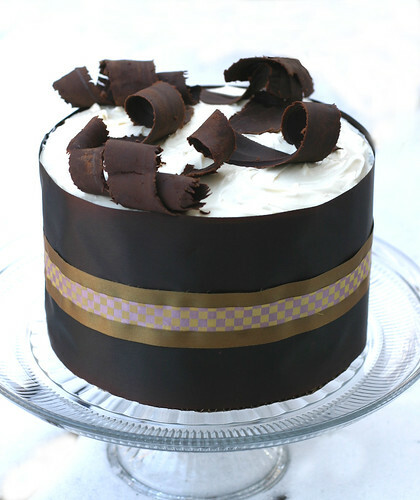 The cute ribbon wrapping idea came from Sky High Cakes. How many times the recipe was made for the wedding cake is a mystery. It looks like I must’ve made it a BAZILLION times. Wanda chose it from Bon Appetite magazine. Dig this old photo and all that foliage. Sorry about the resolution – were there digital cameras in 1996? Oh look here’s SFB at the top of the cake. That’s THE most beautiful cake I’ve ever seen. It ranks right up there with Sean and Wanda’s wedding cake and your peanut butter/chocolate/peanut-brittle masterpiece! 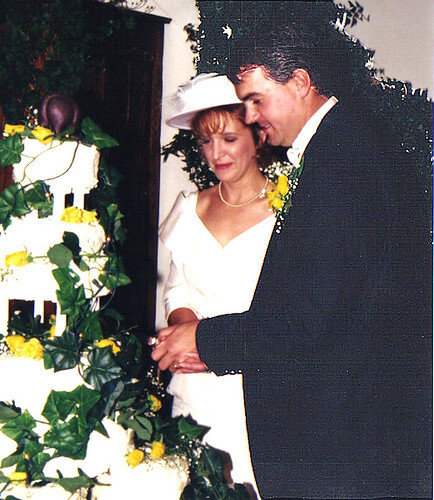 By the by, Wanda and I were just reminiscing about her wedding cake with SFB on top, and how hysterically funny we thought it was. That tiramisu cake looks amazing! I’m craving a piece right now! Now that is an amazing looking tiramisu. The decoration and presentation is brilliant. The cake look absolutely delish! I’m drooling here! italian cakes are so tasty and creative in any kind of a ceremony joys.. It will take you to the recipe. Beautiful cake–you are truly a talented baker. I went to the recipe and saw that a lot of people had trouble with the frosting being runny and many also suggested using more soaking syrup. Did you make it as is and would you recommend any changes? …but I am going to become more adventurous after seeing your work! Your link looks equally delicious!! !